So its true, I wear glasses. Actually, I wear contacts regularly but sometimes I need to give my eyes a break and pull out my glasses. My eyesight is bad enough that I need to either wear my contacts or glasses and I could never go without either. Only recently did I start wearing my glasses for long periods of time. I have even gone two full weeks wearing this pair of glasses. This may not be a long time for most but is for me, you used to never catch me in my glasses. This stems from finding out I needed glasses when I was in the fourth grade. Of course, back then, my parents didn't know about getting the extra thin lenses or thinking about frames that fit the shape of my face. No, I had the large pink or gold metal glasses that followed me throughout my adolescence until my senior year in high school when I saved up my lunch money to buy myself my first pair of contacts. So, for a long time, I never wanted to wear a pair of glasses again. I never would even bother looking for a decent pair that I may like, I would just get something to have just in case I needed it. Until last year, when I went for my yearly check up and the assistant at Lens Crafters helping me with my contacts convinced me to invest in something that would also make me happy. I bought these Tiffany glasses and they have made a huge difference. I don't feel like that awkward little girl with the big and thick glasses and now feel like they are another part of my outfit that I actually like on me. They are another accessory and it's important, like anything else you wear, that you feel good in them! 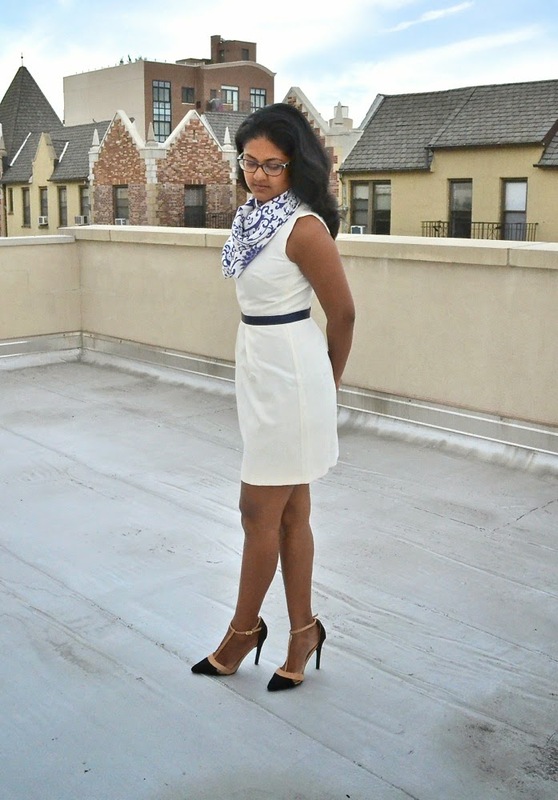 Along with the glasses, this white dress with blue trim is from Asos which I paired with this silk scarf I bought in Shanghai last year. It's very simple but I like how the dress fits and the exposed zipper adds the extra special detail. 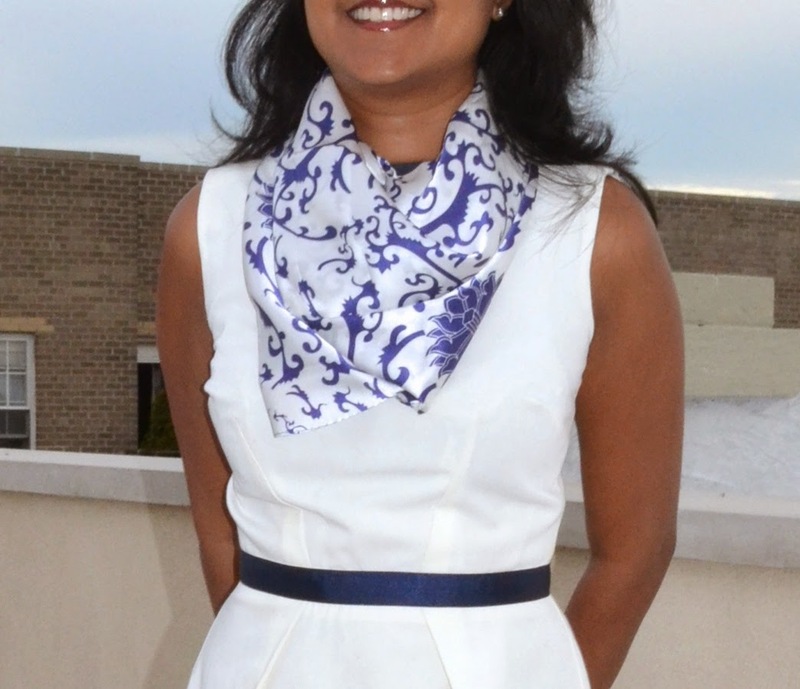 The detail of the scarf is on display due to its contrast against the white dress. Pair this with my T-strap heels from JustFab and enjoyed another great day of weather! A very lady like and elegant combo! Who are you and what have you done with my Andrea?! Lol. And those frames are definitely a departure from the days of old. A very smart looking pair I would rock in an instant. I would have love to have seen a close up pic of them. Oh and I love the visible zipper detail. I'll have to keep that in mind for a future DIY sewing project.